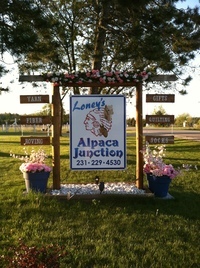 At Loney's Alpaca Junction, we take pride in our customer service as well as the quality of our alpacas. We are available to take your questions 24 hours a day, 7 days a week. Learn from our experience. At Loney's Alpaca Junction, we ARE the hired help. Take a look at our alpaca studs. We have a number of alpacas from well know award winning bloodlines to choose from. Stop by and see for yourself! Great care for your alpacas at reasonable rates. We treat all alpacas the same, yours or ours. Free agistment for up to 90 days with purchase. Alpaca products of all kind. Socks, scarves, yarn, mittens, roving, etc. Long arm quilting machine work. Many Misc gift items. By chance or call for an appointment today.